This buzzing hub for Columbia theatre is the home base for a community of performers and artisans who stage nearly 40 productions a year. Newly renovated in 2018, the Getz Theater Center is the central hub for Columbia theatre. You’ll learn to use industry-standard tools and equipment, create custom sets and costumes, and design with cutting-edge sound and LED lighting technology. You’ll have opportunities to perform on a variety of stages, including our new Courtyard Theater and our flexible black box spaces. For Mainstage production information, including tickets to our current season, visit theatre.colum.edu. 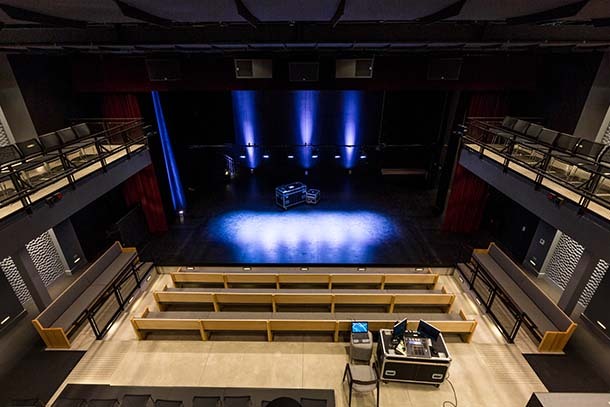 The 181-seat Courtyard Theater has intimate seating and a second-story balcony overlooking the stage. A catwalk and motorized line sets allow for flexible lighting capabilities. Backstage doorways lead to dressing and makeup rooms, and a 16-foot pass-through door allows set pieces to be rolled directly on stage from the scene shop. 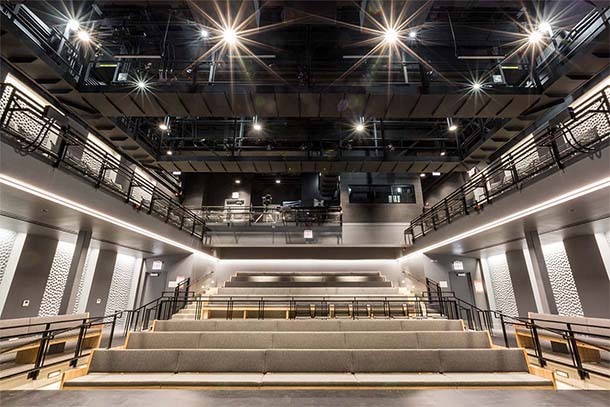 The Classic Theater is a traditional black box space: It’s flexible, allowing students to experiment with audience seating and dynamic design. Depending on set-up, the space can seat up to 75 people. This larger black box allows a greater level of production work, both with inventory of lighting and scenic elements. Students direct, produce, and act in more advanced projects here. Our largest black box space is especially well-suited for multimedia projects and allows for flexibility to build immersive and unique sets and innovative lighting and sound designs. Our state-of-the-art scene shop has all the tools and equipment you'll need to design, construct, and assemble sets. The space can be reconfigured to accommodate individual construction projects. Students learn proper techniques for using a variety of tools, including saws, miters, drill presses, and sanders. A state-of-the-art dust collection and particulate filtration system assures safety. The shop is also equipped with a large paint frame, lit with warm LED lighting for painting back-drops. A 16-foot-tall load door allows the production teams to roll set pieces directly onto the Courtyard Theater stage. 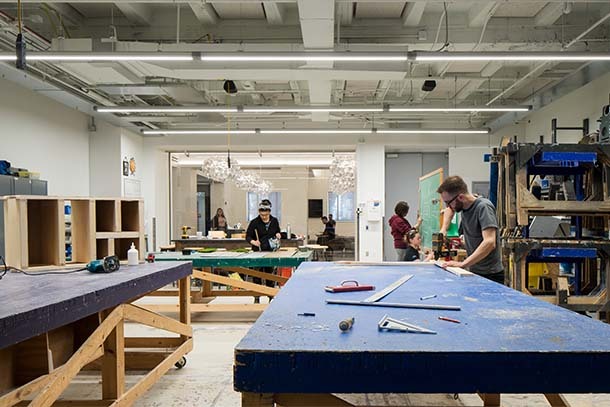 And, a plate glass window between the shop build space and the lobby allows students to showcase their work as it's being constructed, giving patrons a glimpse behind the scenes. 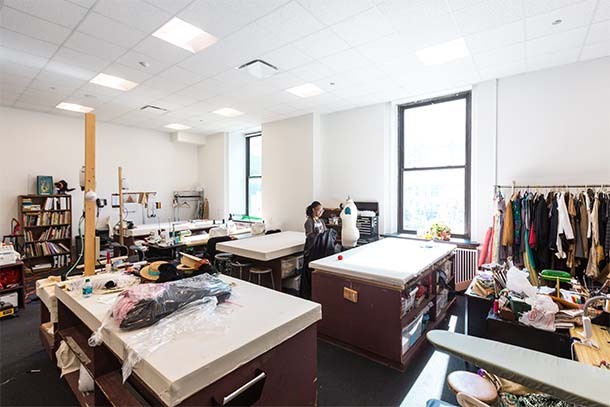 With plenty of workspace for students, the costume shop has industrial sewing machines, as well as tools to press, alter, and dye. This space also houses hundreds of garments from different time periods. A costume borrowing shop next-door allows students to check out pieces for their independent projects or coursework. The prop shop houses furniture, rugs, lamps, and other important scenic elements as well as hundreds of props. The props are available for students to check out for their independent projects or coursework. 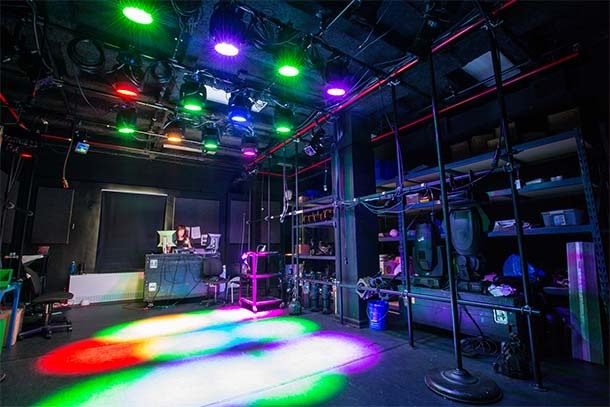 A dedicated space for learning and designing theatre lighting allows students to experiment with cutting-edge LED and moving light technologies and consoles, as well as traditional lighting for a variety of live performance events, including theatre, concerts, and dance. 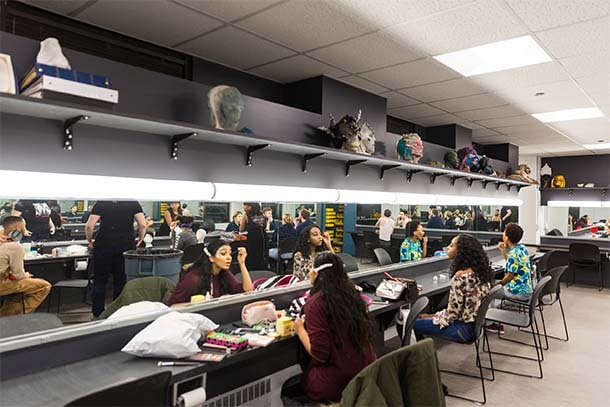 A large and brightly lit makeup and prosthetics lab provides students ample space to learn a variety of techniques for theatre, film, TV, and avant-garde. Dedicated sinks and counters allow for immersive hands-on classes. You’ll also learn the safety protocols required for a variety of materials, including latex, foam, and silicone.